For my job, I have the amazing privilege of working with children with disabilities and their families. After their child is born I am often one of the first professionals to come into their home and offer the parents coaching, education, training and hope for their child’s learning and development. Over the weeks…months…sometimes even years…we all bond closely as we work together as a team helping their son or daughter reach milestones we weren’t positive he/she would be able to achieve. One little boy that I have been working with for the last couple of years has found a particularly special place in my heart. He is so sweet, thoughtful, and personable. He’s one of the most polite little guys I have ever met…he’s just now learning to talk and the words he puts together are so kind and considerate. His favorite words these days are “Thank You!” He says these words in such a sweet innocent voice…in fact quite often he’ll say it at times that you wouldn’t expect a 2-year-old to say thank you, like when mom is telling him he can’t go in the drawer and pull all the utensils out yet again. Come on, what 2 year olds favorite words are Thank You? This boy is really special! There’s some level of deep understanding and insight in this little guy that I’ve been privileged to watch unfold. He was born prematurely and developed something called Periventricular Leukomalacia (PVL) which resulted in brain damage and neurologic dysfunction. At first when I began working with him he couldn’t do anything…literally. His mother’s goal was that she would be able to put him down to play for 5, 10, or maybe even 15 minutes (that would be exceptionally long) without him crying. He had no ability to entertain himself or calm himself down when she left the room. She just wanted to go grab some food to eat or put away the dishes. We had to figure out when her son really needed her assistance and when he just needed to find a way to calm himself down. This isn’t an easy task when you have a child with a special need. As a physical therapist in early intervention, I truly want what is best for a family and I work to support their confidence to understand and facilitate their child’s learning and development. This little boy is strong and determined, so over the years he has far exceeded his parent’s goal and now can play by himself crawling around on the ground. It’s so exciting to see him making leaps and bounds in his development. His family can’t wait for the day when he can walk around and play with his big sister, in fact they even have a picture framed in their home of the first time he could stand up by himself next to his big sister, with her arm lovingly wrapped around him. Over the last few months the family has been focused on helping him walk during play and other family routines. Typically, dad is work during intervention sessions, but yesterday dad was there, and let me tell you, it was a special moment. The feeling of awe and amazement was palpable as dad walked into the room. He was frozen in the middle of the living room in delighted shock. 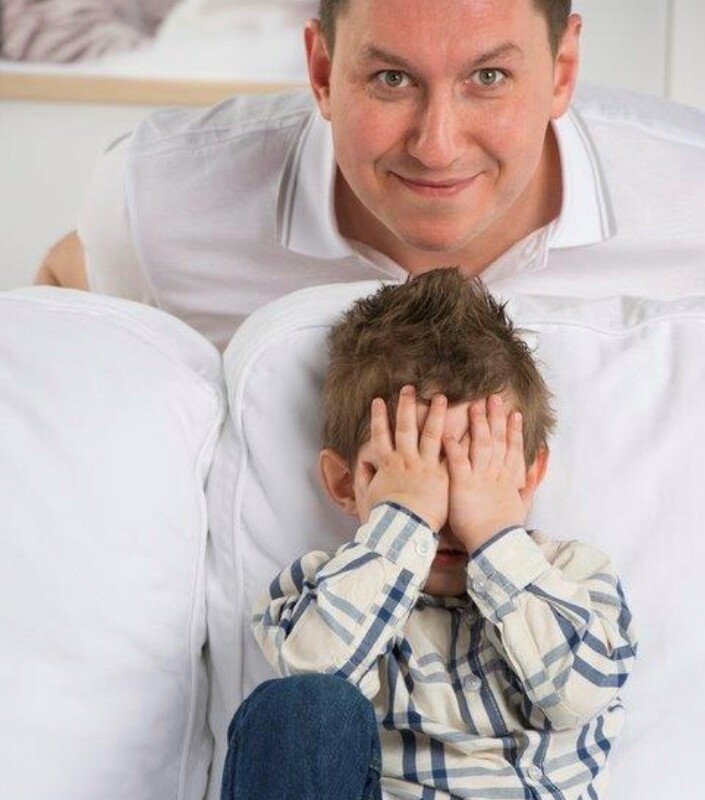 But that didn’t last long, in fact within seconds dad had gotten in on the fun, helping his almost 3-year-old son take some of his first steps, as they went seeking out big sister, who was hiding behind the curtains. There was the beautiful sense of togetherness and fulfillment as this family got to play their first game of hide and seek together. Afterward Dad sat there in a dazed awe as if he had witnessed one of his dreams becoming a reality. That is part of the reason I love my job. I get to empower families to reach their full potential and even on days exceed their hopes and expectations. Now don’t get me wrong, this little boy still has a long way to go…he won’t be walking by himself any time soon, but he is one step closer.